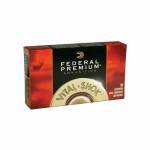 The Range Target Practice load features a full metal jacket bullet with a brass case. 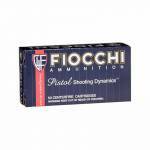 This 45 ACP model comes packaged 50 rounds per box, 20 boxes per case. Caliber 45 Automatic Colt Pistol (ACP) Model Range and Target Bullet Weight 230 GR Rounds Per Box 50 Casing Material Brass Application Target / Range Practice Bullet Type Full Metal Jacket Muzzle Energy 404 ft lbs Muzzle Velocity 890 fps ..
Federal V-Max 5.7mmX28mm 40gr - 50/box. An accurate, flat-shooting round ideal for target shooting. Features a polymer-tipped bullet that enhances accuracy, creates rapid expansion and brings ricochet to a minimum. Caliber :5.7mmX28mm Bullet Type :V-Max Bullet Weight :40 GR Muzzle Energy :256 ft lbs Muzzle Velocity :2034 fps Rounds Per Box :50 Rounds Per Box, 40 Boxes Per Case Game Category :Target Casing Material :Brass ..
Sizzling velocity and explosive disruption make V-Shok the ultimate choice for your favorite varmint. It's available in your favorite prairie doggin calibers and features the best bullets available for any varmint from Nosler Ballistic Tip to Sierra GameKing, MatchKing, and Varminter. Take V-Shok along for the hunt. 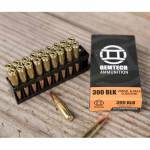 Mfg Item Num: P2506G Category: CENTERFIRE RIFLE ROUNDS Caliber :25-06 Remington Bullet Type :Nosler Ballistic Tip Bullet..
Federal V-Shok 22-250 REM. 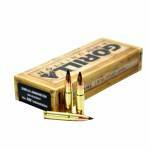 Nosler Ballistic Tip 55gr - 20 Rounds. 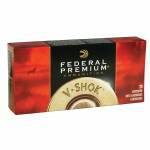 V-Shok is the ultimate choice for varmints with extreme velocity and explosive impact. Caliber :22-250 Remington Bullet Type :Nosler Ballistic Tip Bullet Weight :55 GR Muzzle Energy :1645 ft lbs Muzzle Velocity :3670 fps Rounds Per Box :20 Rounds Per Box Game Category :Varmint Casing Material :Brass ..
Federal Vital Shok .243 Win Sierra GameKing BTSP 100gr - 20 Box. Vital-Shok is available with the world's finest big game bullets, from the unrivaled Trophy Bonded family to Nosler, Sierra and Barnes. Match that with world-class brass, select powders and legendary primers and you get ammunition you can truly believe in. Mfg Item Num: P243C Category: CENTERFIRE RIFLE ROUNDS Caliber :.243 Winchester (6.16x51mm) Bullet Type :Sierr..
Federal Vital-Shok .243WIN / 6.16x51mm 95 gr NBT - 20 Rounds. 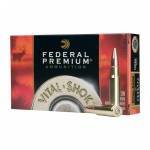 Vital-Shok Load No: P243J Caliber: 243 WIN (6.16x51mm) 95 Grain Bullet Style: Nosler Ballistic Tip Muzzle Velocity: 3025 Muzzle Energy: 1930 .. The Nosler® Partition® was the first bullet loaded in the Federal Premium® line, and it continues to be a standard for consistency and reliability. Its partitioned lead core allows the front half of the bullet to mushroom on impact, but keeps the back half intact for deep penetration. Caliber :22-250 Remington Bullet Type :Nosler Partition Bullet Weight :60 GR Muzzle Velocity :3500 fps Rounds Per Box :20 Rounds Per Box, 10 Boxes Per Case Game C..
Federal Vital-Shok 308 Win (7.62x51mm) 180GR Trophy Bonded Tip. World-class brass, select powders and legendary primers come together to create one of the finest big game bullets. Ideal for medium to large game. Mfg Item Num: P308TT1 Category: CENTERFIRE RIFLE ROUNDS Caliber :308 WIN (7.62x51mm) Bullet Type :Trophy Bonded Tip Bullet Weight :180 GR Muzzle Energy :2743 ft lbs Muzzle Velocity :2620 fps Rounds Per Box .. 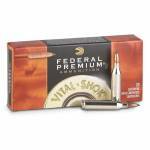 This bulk pack of Federal 5.56 ammo is 62 grain full metal jacket ball rounds. Caliber :5.56 NATO Bullet Type :Full Metal Jacket Bullet Weight :62 GR Muzzle Energy :1260 ft lbs Muzzle Velocity :3025 fps Rounds :150 Rounds Application :Target Casing Material :Brass ..
Fiocchi Pistol Shooting Dynamics .357 Sig 124gr FMJ - 50 Rounds. Mfg Item Num: 357SIGAP Category: CENTERFIRE HANDGUN ROUNDS Caliber: 357 Sig Sauer Bullet Type: Full Metal Jacket Bullet Weight: 124 GR Muzzle Energ: 502 ft lbs Muzzle Velocity: 1350 fps Rounds Per Box: 50 Application: Performance/Protection Casing Material: Brass .. The Shooting Dynamics line offers reliably performing products for every shooting application from plinking to target shooting to hunting. 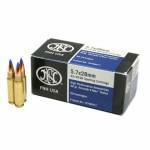 This ammo is loaded in the U.S.A. utilizing Barnes Tipped TSX lead-free bullets, top quality powder and selected components. 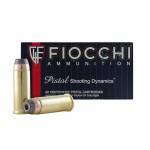 Fiocchi's goal is to make it possible for hunters and rifleman to enjoy volume shooting without emptying their wallets. Bullet Weight: 200 Grains Bullet Style: Semi-Jacketed Hollow Point Brass Case Muzzle Velocity: 900 fps .. Created to give the quiet shooter and affordable and dependable training round. Subsonic ammunition features a 208gr bullet with a polymer tip that provides excellent stopping power making it an excellent deer or hog hunting round as well as a good home defense round. Low recoil is excellent for recoil sensitivity issues. 208 grain bullet 1020 FPS Polymer tip ..
Gorilla Ammunition utilizes only the highest quality components to manufacture premium quality match grade loads. Match grade primers and top quality projectiles make this load a go to choice for competition or small game hunting. Varmageddon bullets are made with a lead-alloy core and feature a copper-alloy jacket designed to withstand high velocities yet expand immediately upon impact. Caliber 300 AAC Blackout / Whisper (7.62x35mm) Model Gorilla Match Series Nolser Varmageddon Bullet Wei.. 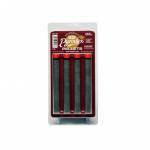 Designed for shotguns and rifles, 50 caliber and larger, as well as cartridges. FFG is also usable in muskets and large-bore pistols. 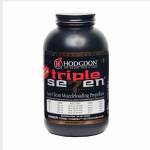 Hodgdon’s revolutionary granulated muzzleloading propellant that cleans up with water alone. Contains no sulfur, so there are no strong smells and clean-up is a breeze. Available in a 1-LB container. Extremely Flammable - Sold in Store Only, not shippable. 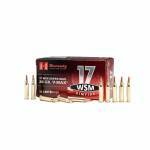 ..
From prairie dogs to coyotes – the 17 Win Super Mag from Hornady is a fantastic new option for varmint hunters everywhere. Filling the gap between the 17 HMR and the centerfire 17 Hornet, the 17 Win Super Mag fires a 20 grain V-Max bullet at 3,000 fps. The polymer tip of the V-Max bullet delivers more than tack-driving accuracy at long range -- it also creates dramatic expansion on impact. 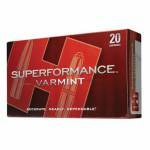 Retaining over 2,000 fps of velocity at 200 yards, the 17 Win Super Mag provides plenty of velocity for the.. 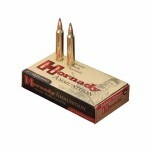 The industry's leading varmint round resulting in ultra fast polymer tipped bullets. 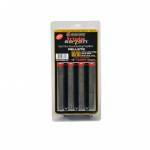 Provides maximum accuracy and explosive expansion. Caliber :204 Ruger Bullet Type :V-Max Bullet Weight :40 GR Muzzle Energy :1351 ft lbs Muzzle Velocity :3900 fps Rounds Per Box :20 ..